Are you a fowl or an owl? We have been conditioned that the only way to success is to be an early riser. What if you are not? Did you know that you are born with your own chronotype or your own sleep preference? You see, we are pre-programmed with a tendency to be a night-owl or an early rising fowl. Whilst it can be changed, it may be hard to change your natural body clock. What does it mean if you are an owl? Well, it may mean you suffer from something called ‘social jet-lag’. You may feel you are always tired trying to adjust to the school or work schedules of the ‘early bird centric society’ we live in. 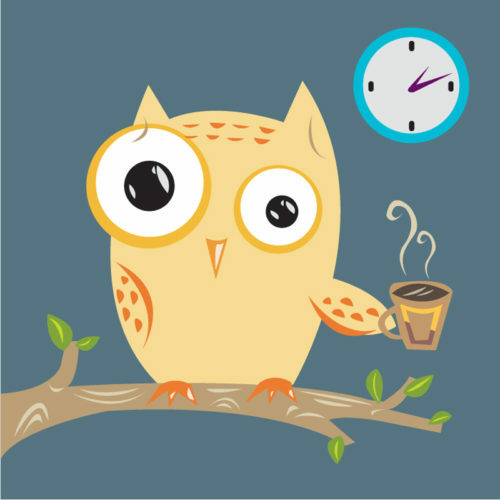 On the down side, owls are more likely to skip breakfast (although current research suggests that that may not be a bad thing if you are trying to shed some kgs) and drink pots (rather than cups) of coffee. Sleep with the curtains open to let light in (depending where you live of course). Get some fresh air as soon as possible after waking – a brisk walk around the block may help. Rise at the same time every day. Do as much as you can the night before, e.g., get your clothes ready, prepare your lunch. If you do burn the midnight candle, work out your most productive times and honour that. Did you know that our cortisol (stress hormone) gets replenished between 9pm-1am? Every hour of sleep before midnight is worth 2 after. One final note, it you are a fowl, don’t talk to those owls before double digits (take if from someone who knows)!! !